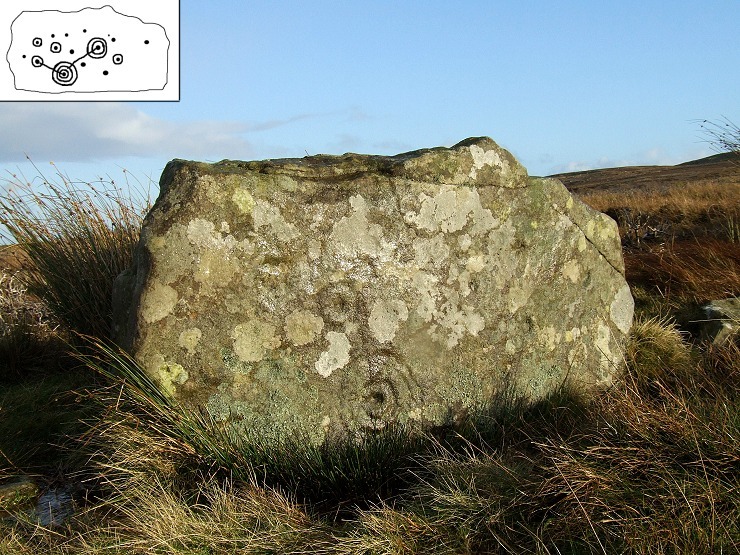 This stone was discovered in 2006 by Richard Stroud and shows a highly complex design of cups, rings and grooves that would be almost impossible to describe in words. Many of the cups are surrounded by rings and many of the motifs are linked together by grooves, some of which also enclose yet more cups. It seems that the carver's intention was completely cover the surface of the rock and because it has lain under cover for so long the carvings have been protected from the worst of the weather - in places it is possible to see individual pick marks. 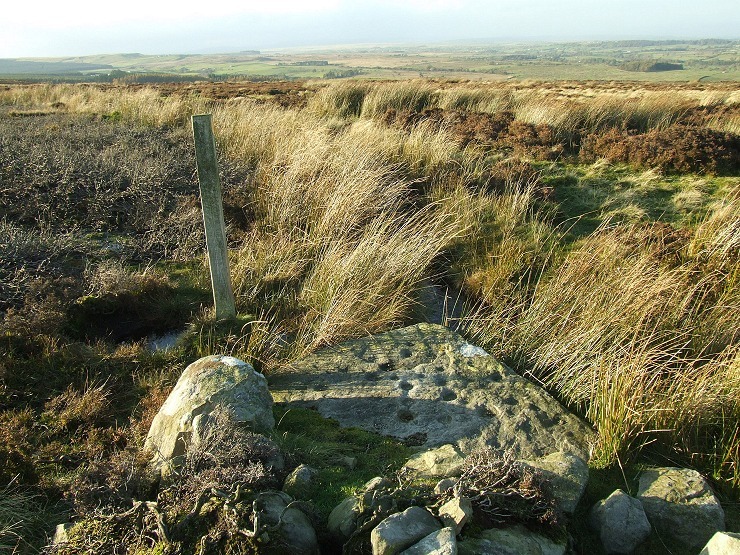 This rock is located 20 metres NNW of the first stone on this page, both of which stand on a raised plateau to the east of Wash Beck. The main designs are a pair of cups each with three rings with possible unfinished forth ring and well as another couple of cup and rings motifs along with several other deep cups, some linked with grooves. 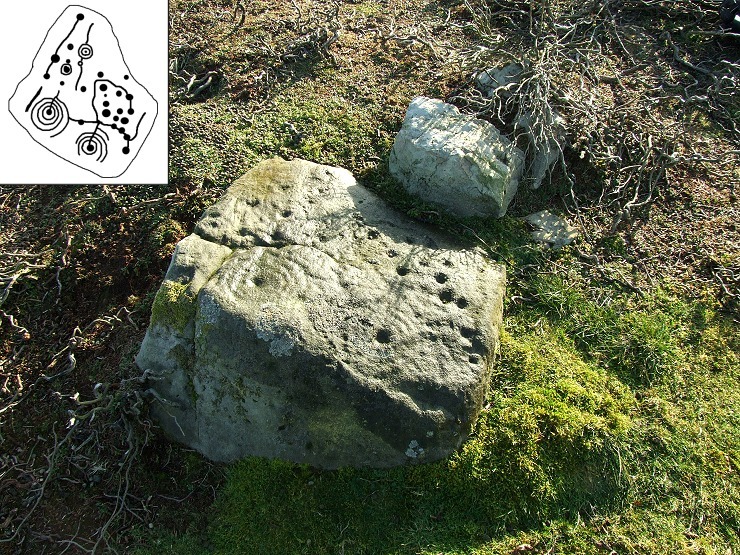 This boulder stands on the opposite (west) side of Wash Beck to the two previous stones and probably lay flat when carved but has since been placed on its side. The clearest motif is the cup with three rings at the bottom of the stone but there is also a cup with a pair of rings and four further cup and single ring carvings along with some scattered cups. Three of the motifs are linked by a pair of grooves. There are between 30-40 cups on this stone some of which may be natural. 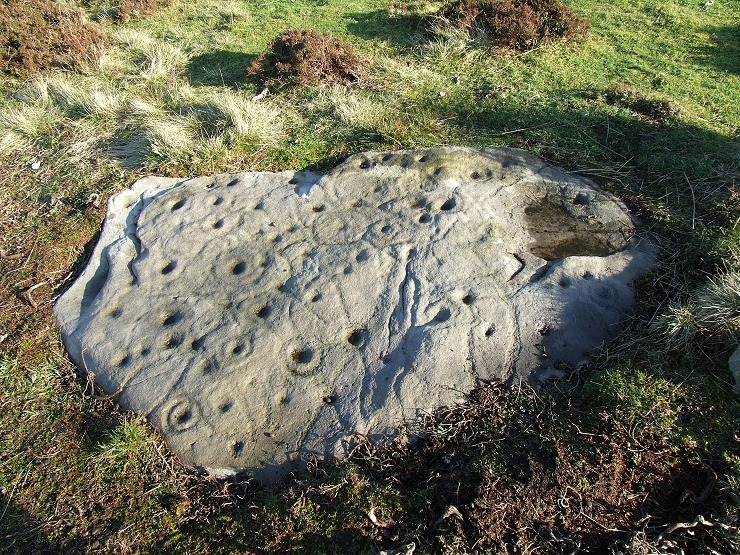 This badly eroded stone is located in deep heather on east side of Wash Beck close to a track that runs north-south across the moor. 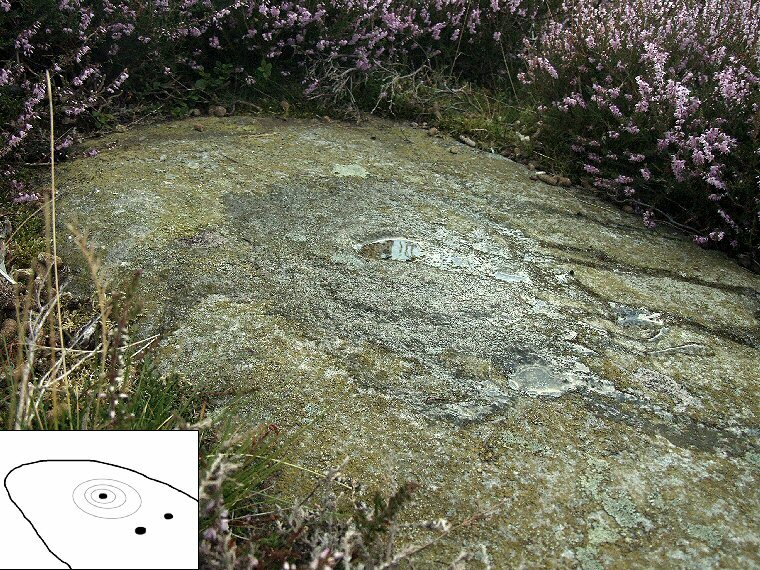 Its flat face features a cup mark that is surrounded by three worn rings that are difficult to make out in the photo despite me trying to mark them with water - the diagram is a best guess based on existing plans. Below these rings are further pair of cups.